Anyone who ever has traveled to a different country knows it's always better to take a friend. That's exactly what Jakub Culek and Petr Straka did last summer when they decided to seek their hockey fortunes in Canada. The forwards left their junior teams in the Czech Republic for spots with the Rimouski Oceanic of the Quebec Major Junior Hockey League, and seem be the better for it. Straka, a 6-foot, 185-pound right wing, was named QMJHL Rookie of the Year after leading the league's first-year players with 28 goals and 64 points in 62 games; he followed that with 14 points in 12 playoff games and is ranked No. 23 on Central Scouting's final list of North American skaters available for the 2010 Entry Draft, scheduled for June 25-26 in Los Angeles. "Good skater, good hands, sees the ice well," Chris Bordeleau, Central Scouting's QMJHL scout, told NHL.com of Straka. "He's involved. He's first on the puck and first in the corners to get the puck. A lot of other guys let the other guy go, but he's first. And he really came on at the end of the season." Even before Rimouski Oceanic forward Petr Straka knew he could be a professional hockey player, he figured learning English would be a good idea. Back then, he didn't know how good it would be. "I was 5 when I went to school and took courses to try to learn English," Straka told NHL.com. "Just basic words like butterfly. It was just for fun. Later it came this way, that I'm going to try hockey in NHL and I would need it." Having that basic knowledge helped him in his adjustment to life in North America. "If I didn't play hockey, I could speak English anywhere," he said. "It's a foreign language, so it's good to know that." He still took English classes this season, and also helped translate for Jakub Culek, his long-time friend and teammate who also plays for Rimouski. "Petr is a good guy," Culek told NHL.com. "Every time he helps me, because I speak not good English. Petr speaks good. … I go to an English course, but with Rimouski, sometimes I don't understand, so Petr tells me and I know what to do." Culek, a 6-foot-3, 185-pound left wing, had 13 goals and 47 points in 63 games, and another 9 points and a plus-5 rating in 12 playoff games. Central Scouting has him at No. 58. Of Culek, Bordeleau said, "He's a good-sized kid. … Real good hands, good passing skills, sees the ice well. He lacks a little bit in speed right now, that's what he's got to work on, his skating. Other than that he's a pretty big kid and has a good upside." Bordeleau also gave both high marks for being brave enough to cross the Atlantic to play for a young Rimouski team. "It was a tough situation," he said. "It was a bunch of young kids, so it was a tough to work around with so many young kids, but they adapted well." It wasn't an easy decision, but it was just another step in the long-lasting friendship the pair has developed. "We've known each other since we were 7 years old," Straka told NHL.com. "We're from the same city (Plzen). We've known each other since we were young. We played together since we were young." The pair developed in the Plzen youth leagues and played together all the way through the Plzen team in the Czech junior league. But at a certain point, Culek and Straka realized the next step in their development needed to be in North America. "I find the Quebec league, or generally the CHL, is better than Czech junior league," said Straka. "I think I have a chance to be a better player than if I stayed in Czech. The quality (of play) is much better here." It just worked out that following the 2008-09 season, Rimouski GM Yannick Dumais knew he was going to have his allotted two spots for European skaters come open, so he began consulting with agents, Then he saw Straka and Culek at the World Under-18 Championship in Fargo, N.D.
"From Straka, good explosion, he skated very fast," Dumais said. "Good hands, goes to the net, but his skating was very, very good. He impressed me with his speed. And Culek, his size, good hands … a lot of players that size, their hands aren't that good, but he's got good hands and he can play both sides of the ice. "I loved what I saw. They were the only 16-year-olds on their team. What I saw from Straka and Culek, I liked that. I told my owner if we're able to pick them, we will pick them." Trouble was, Rimouski's first pick was at No. 37, and Dumais didn't think Straka would still be there, so he made a trade with Rouyn-Noranda to acquire the 22nd pick, where he was able to get him. With Culek, all Dumais could do was hope. 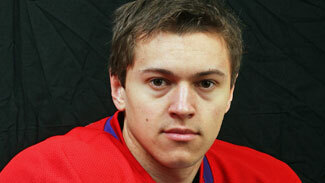 "Jakub had less ice time at the Under-18, and we crossed our fingers and hoped Jakub would be there at 37," he said. "We were very happy to have both players on our team." Dumais assumed his new players would need some time to get used to a new country, a new language and a new style of play. However, both players arrived more ready then he thought. "We were a little bit surprised how fast it was," Dumais said. "I'm pretty sure at 18, 19 they'll be good players in our league, but at 17 they're so good so fast. Right away their adjustment was so fast. They work hard with the coaches to make sure they know the game plan. They know everything -- where they need to go on defense, where they need to go when we don't have the puck. But with their offensive talent, they showed us what they can do on the ice." As well as they've adjusted on the ice, Straka and Culek have made a nice transition into the community. "The big adjustment is the language, because Rimouski is a French city, and a lot of players are French," Straka said. "It's 19 of 24, so there are three English-speaking guys and two Czechs, and two of the three English guys speak French because they're from Montreal. So that's a big adjustment." Both players are taking English-language classes in school, and teammates are helping them pick up French, in the way only hockey teammates can. "First things I learned were swears," said Straka. "It's good on the ice." Straka and Culek have helped each other make things good off the ice, as well.